Background: Dibenzo-oxazepine and Benzothiazole derivatives are used as antipsychotics, anticancer, antibacterial and anti-inflammatory agents. Methods: Arylidene derivatives of 1,2,3,4-Tetrahydro-Dibenzo[b,f][1,4]Oxazepine and 2-[2-Chloro- Cyclohex-1-enyl]- Benzothiazoles were synthesized by reacting benzylidene derivative of chloroaldehyde with 2-aminophenol and 2-aminothiophenol respectively. Benzylidene derivative of chloroaldehyde was prepared by Vilsmeier reaction of 2-benzylidenecyclohexanone derivatives, which were obtained from the condensation of various aromatic aldehydes with cyclohexanone. 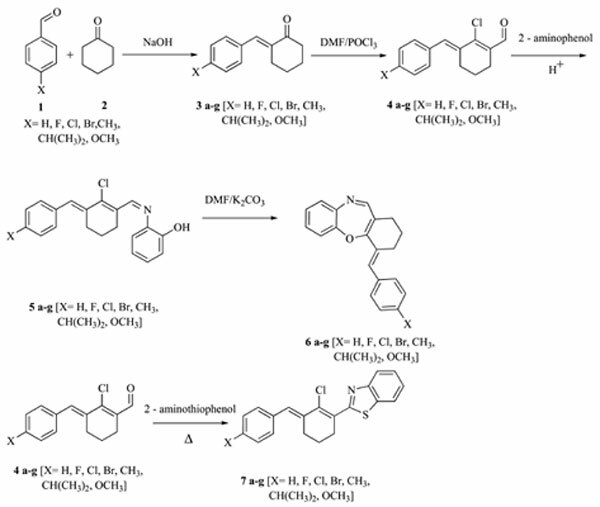 Results: Benzylidene derivatives of 1,2,3,4-Tetrahydro-Dibenzo[b,f][1,4]Oxazepine 6a-g exhibited promising antiproliferative activity with GI50 values in the micromolar range. The compounds containing halo, alkyl and alkoxyl groups as substituents on the benzylidine ring have been found to be very effective cytotoxic agents. Conclusion: This study identified dibenzo-oxapine as a prospective pharmacophore which set the stage for thorough exploration of this compound class as cytotoxic agents. Antimicrobial, benzylidene derivative of chloroaldehyde, 2-[2-chloro-cyclohex-1-enyl]- benzothiazole derivatives, cytotoxic activity, 1, 2, 3, 4-tetrahydro-dibenzo[b, f][1, 4]oxazepine derivatives.